1. Lunchtime football for Black Knights: Navy announced it’s home football schedule and TV plans earlier this week, and Army followed suit Thursday, putting out its plan for 12 p.m. kickoffs in all seven of its home games. Like Navy, all Black Knights home contests will air on CBS Sports Network. That sets up service academy doubleheaders Sept. 29 (Army-Stony Brook, Navy-San Jose State), Nov. 3 (Army-Air Force, Navy-Florida Atlantic) and Nov. 17 (Army-Temple, Navy-Texas State). The rest of the Army home slate: Sept. 15 (Northern Illinois), Oct. 6 (Boston College), Oct. 13 (Kent State) and Oct. 27 (Ball State). The Nov. 3 Army-Air Force game had been set for Yankee Stadium, but a possible World Series conflict reportedly scuttled those plans and moved the game to Michie Stadium. Army’s season begins Sept. 8 at San Diego State, time to be determined. 2. Speaking of TV: Still wondering how a move to the Big East might benefit Navy football? Memphis athletic director R.C. Johnson gave a pretty good reason in a recent radio interview, saying each league member could pull in a TV contract worth $13 million. Navy’s pie slice would be smaller come 2015 because the Mids will be football-only members, but the school still would benefit from a potential bidding war between ESPN, Fox, NBC, CBS … heck, let’s throw in TBS for the fun of it. NBC is an especially attractive target thanks to its rebranding of the NBC Sports Network (formerly Versus) and integration with its Comcast sports properties. The conference also could start its own network. Or the deal could be split, sending games to multiple channels. Just make sure your remote has batteries. 3. 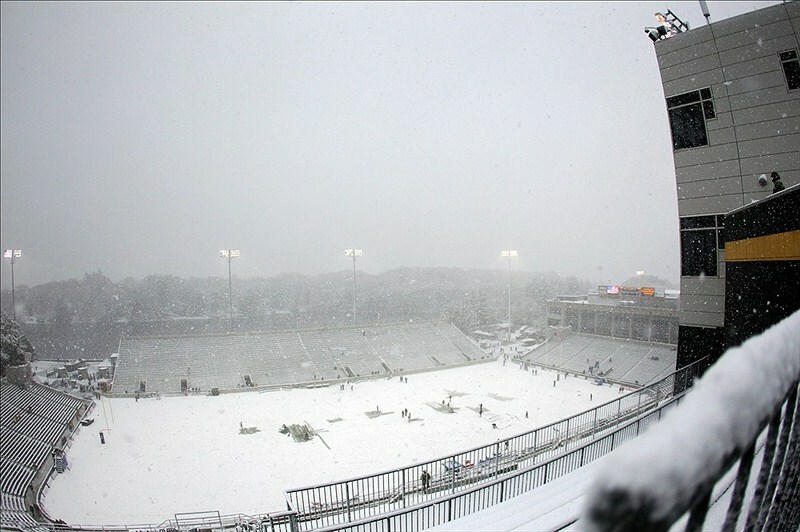 Winter bowling: Aside from its home slate, Army also knows where it’ll play if it finishes .500 or better — the Military Bowl presented by Northrop Grumman will be Dec. 27 at RFK Stadium in Washington, according to a news release on the bowl’s website. Army will face a team from the Atlantic Coast Conference, unless there’s a repeat of the 2011 scheduling gymnastics that resulted in a service academy team that wasn’t originally scheduled (Air Force) facing a team from a conference that wasn’t originally scheduled (Toledo, out of the Mid-American). As always, follow @sgtstripesMB on Twitter for your latest Military Bowl news — we at After Action were worried about the sergeant until he chimed in with an NFL draft tweet late Thursday, but he’s back in business as one of the most popular photo-manipulation-generated football mascots around.